The results of the Trends in International Mathematics and Science Study were released in December, detailing the performance of fourth- and eighth-graders around the globe. Among eighth-graders, the top five nations in combined mathematics and science performance were Singapore, South Korea, Taiwan, Hong Kong and Japan. Among fourth-graders, the top four nations in combined mathematics and science performance were Singapore, Japan, Taiwan and Hong Kong (Korea did not test students in the fourth grade). The notion that America’s public school problems are confined to inner cities, and that our wealthy suburbs produce world-beating high school graduates, is a myth. How did the United States perform compared to other industrialized nations — that is, the top 40 nations in terms of per-capita income? At the fourth-grade level, American students were nine points above the rich-country average in science and 11 points below it in math, putting them almost dead average overall. At the eighth-grade level, American students were four points below the rich-country average in science and 24 points below it in math, putting them clearly, but not abysmally, below average. U.S. eighth-graders’ overall performance does not appear to be too far below the average of industrialized nations — but let’s look closer. Many nations that typically outscore the United States in math and science at the eighth-grade level did not participate in TIMSS 2003. However, eight of these nations participated in another test of mathematics and science: the 2003 Program on International Student Achievement (PISA). 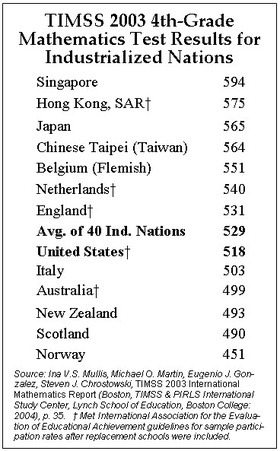 Tellingly, every one of the eight countries significantly outscored the United States on the PISA test. In math, Canada bested us by 49 points, while Finland outscored us by 61. In science, France and Switzerland beat us by 20 and 22 points, respectively. If all of these nations had participated in TIMSS 2003, it seems likely that U.S. performance at the eighth-grade level would have been considerably further below the average of industrialized nations than it already was. One question is often raised in response to international test comparisons: Do these results really mean anything? In the past, international testing programs have been criticized on a variety of grounds. Two allegations, in particular, have been common: first, that other nations have not tested as large a percentage of their student population, and hence their scores have been inflated; and second, that our best students are among the world’s best, with our average being brought down by a large cohort of low-achievers. Whatever the historical validity of such concerns, they are now, if anything, reversed. Particularly in the fourth and eighth grade, education has become universal in all of the leading nations. Moreover, in science, the overall U.S. participation rate (the percentage of randomly selected schools that actually did participate) for the eighth-grade was just 73 percent, the third-lowest of all 45 participating countries, and 11 percentage points below the average participation rate of industrialized nations. In fact, the United States had the third-lowest overall participation rate for both grades in both subjects. Japan, Taiwan and Singapore all had participation percentages in the 90s. How about our best and brightest? At the fourth-grade level, there is some truth to the idea that the best American students are among the best in the world. Looking only at the top 5 percent of test-takers, American fourth-graders beat the average of wealthy nations by 13 points. By the eighth grade, however, the tables have turned, with America’s brightest students falling 10 points behind their foreign peers. If we carry this comparison to the final year of high school using the 1998 12th-grade TIMSS results (the most recent available), we discover that America’s top students placed last in combined science and math achievement among all the industrialized nations for which data were available. In both math and science, the gap between our best and the world’s best was substantially larger than the gap between our average performance and the average performance of other nations — not smaller, as many Americans believe. It’s no use claiming that U.S. 12th-graders did abysmally because some nations tested a smaller, more elite subset of the age cohort. The more selective nations generally did worse than the less selective ones, and America’s own graduation rate is below average, meaning we’re not as inclusive as we think. These results suggest we need to face reality. The notion that America’s public school problems are confined to inner cities, and that our wealthy suburbs produce world-beating high school graduates is a myth. It’s time we resolve to do better. Andrew J. Coulson is senior fellow in education policy for the Mackinac Center for Public Policy, a research and educational institute headquartered in Midland, Mich. Permission to reprint in whole or in part is hereby granted, provided that the author and the Center are properly cited.